French police have detained five people believed to be linked to Mohamed Lahouaiej-Bouhlel, the man who killed 84 people in Nice, the Paris prosecutor’s office says. According to Le Monde, three arrests were made on July 16 and two on July 15, including Mohamed Lahouaiej-Bouhlel’s estranged wife. 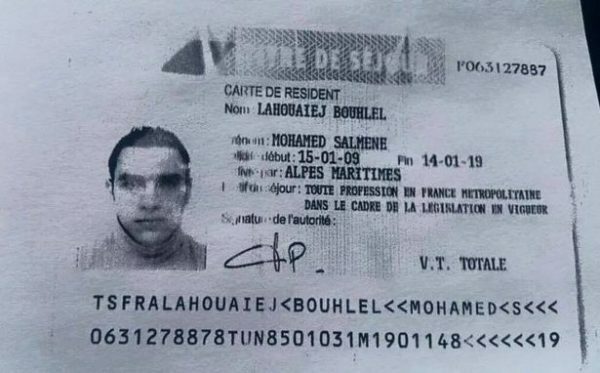 Mohamed Lahouaiej-Bouhlel drove a truck into crowds marking Bastille Day on the Promenade des Anglais on July 14 before he was shot dead by police. ISIS claimed one of its followers carried out the attack. France’s Interior Minister Bernard Cazeneuve said Mohamed Lahouaiej-Bouhlel seemed to have been “radicalized very quickly”. He said the “new type of attack… showed the extreme difficulty of the fight against terrorism”. Prosecutors said Mohamed Lahouaiej-Bouhlel, a 31-year-old Tunisian, drove the truck 1.2 miles along the promenade targeting people. Of the 84 who died, 10 were children. Some 202 people were injured; 52 are critical, of whom 25 are on life support. Stephanie Simpson, from the Lenval children’s hospital in Nice, said 5 children remained in critical condition, one was in a “very bad” condition, three were on artificial respiration, one had been stabilized and one 8-year-old child remained unidentified. President Francois Hollande said 50 people were “between life and death”, while several people are missing. Meanwhile, President Francois Hollande met with his defense and security chiefs and cabinet ministers on July 16. He called for national unity in France and said: “We are in a time when, and we have seen it, there is a temptation to divide the country. Francois Hollande, who says the attack was a terrorist act, has already moved to extend a state of emergency by three months. A state of emergency has been in place across France since the Paris attacks carried out by ISIS on November 13. Francois Hollande had proposed lifting the state of emergency on July 26, but reversed his decision after the Nice attack. Residents of Nice and foreign tourists were killed, among them 4 French citizens, 3 Algerians, a teacher and two schoolchildren from Germany, 3 Tunisians, two Swiss, two Americans, a Ukrainian, an Armenian and a Russian. Mohamed Lahouaiej-Bouhlel was known to the police as a petty criminal, but was “totally unknown to intelligence services… and was never flagged for signs of radicalization,” prosecutor Francois Molins said. However, French PM Manuel Valls said he was “in way or another” linked to radical Islam and Paris prosecutor Francois Molins said the attack bore the hallmarks of jihadist terrorism.